If you have a tendency to need a little extra lighting that can move around with you, you’ll like this tiny light. 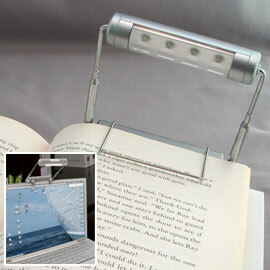 It clips onto whatever you need, be it a book, your laptop or a monitor. It would be especially great for those that travel, because it would be easy to toss into your laptop bag or suitcase. It’s also an attractive light, which is rare for book lights. Usually they are just dull black plastic and look extremely cheap. Luckily this light is cheap, but it doesn’t actually look it. The light has four LED lights which would give you a decent amount of lighting. The light also rotates 360 degrees to make it easier to work. To keep it powered you’ll need three AAA batteries. Apparently the light doesn’t produce any heat either so the batteries will last longer. The light can last up to 100,000 hours. You can pick it up on Solutions for $12. So it would be fairly affordable, plus you can save yourself a battery run and add an extra $2 and they’ll throw in two batteries. I am interested in buying one of these, where can i find one? (I am from MALTA Europe) How much does these LED’s cost?